The Baden Powell Boy Scouts were recognised as a Government non-combatant service at the outbreak of World War 1. 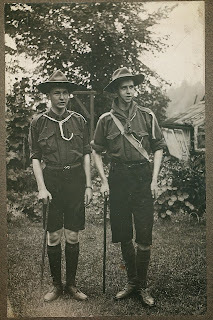 Mr Hugh Goodacre, The Chief Commissioner for Leicestershire, was requested to mobilise one thousand Boy Scouts and they were to be placed at the disposal of the Government. After an appeal to raise money to cover expenses, £471 9s 6d. was collected. During the first six weeks of war Boy Scouts patrolled the Knighton Tunnel and Viaduct on the Midland Railway, and, until well into October, they kept watch at the New Parks, Gilroes and Oadby Reservoirs. During 1915 – 1917, three hundred Leicester Scouts were employed at various patrolling stations on the coast, and in 1918, they assisted at the flax harvest at Edenham in Lincolnshire. Two Loughborough Scouts, Howard Moss and William Jelley, who both attended Loughborough Grammar School, enlisted. 2nd Lieutenant Howard J H Moss (on the left) joined the 5th Battalion of the Leicestershire Regiment and was killed in action on the 13th October 1915 aged just 19 – a date when many soldiers of the Leicestershire Regiment lost their lives at Loos. The family lived at The Knoll, Nanpantan. He is buried at Caberet Rouge Cemetery and commemorated on memorials in St Marys Church, Nanpantan, Emmanuel Church, The Carillon, The Baptist Church and Loughborough Grammar School. Bell 8 in the Carillon Tower was a gift from William and Anne Moss, the Mayor and Mayoress of Loughborough in in remembrance of Howard James Harding Moss and Gerald Alec Moss, their Grandsons. 2nd Lieutenant William Jelly (on the right) was awarded the Military Cross. He was with the 6th Battalion The Yorkshire Regiment when he died of wounds at Rouen Hospital on the 2nd November 1917 aged just 22. His parents lived at 124 Leopold St. Loughborough. He is buried at St Sever Cemetery and remembered on a number of memorials in Loughborough including The Carillon, St Peter’s Church and Loughborough Grammar School.